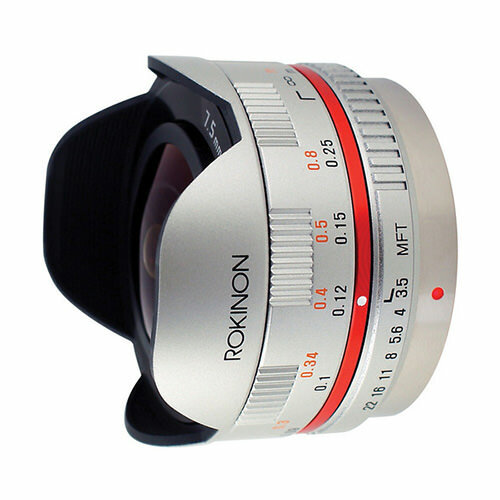 Lens Description: The 7.5mm f/3.5 Ultra Wide-Angle Fisheye Lens for Micro 4/3 (Black) from Rokinon gives you a 180° view with dramatic, exaggerated perspective when used with a Micro 4/3 camera. With hybrid aspherical lenses and a multi-layer coating, you\'ll be able to produce sharply defined images with a minimum of flare and ghosting. This compact and lightweight manual focus 7.5mm lens focuses as close as 4\" (10.16 cm) from the lens for even more dramatic effects. This lens has a built-in petal lens hood.